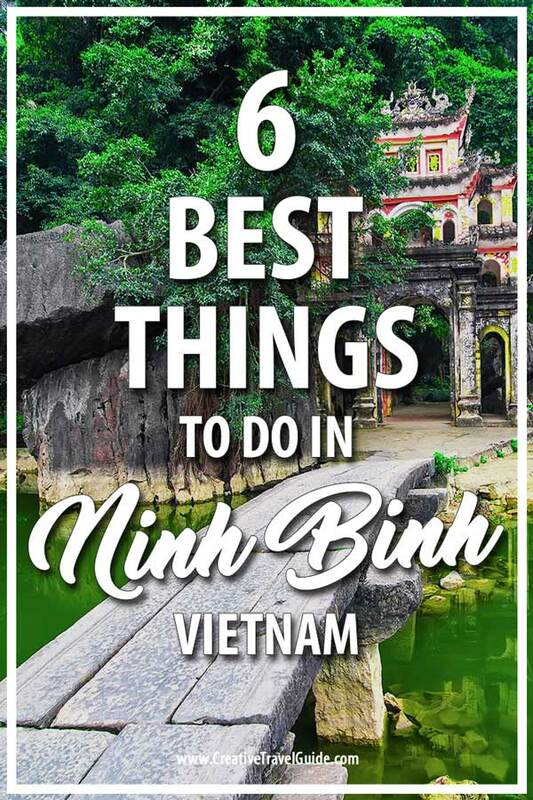 Today we have a guest post from Chris who tells us about the best things to do in Ninh Binh, Vietnam. Situated around 90 km south of Hanoi, Ninh Binh province contains one of the most majestic natural landscapes in South East Asia. Here, karst limestone pinnacles jut out of still waters where boats float lazily by and cranes wheel overhead. Many day trips run to Ninh Binh from Hanoi, mostly involving boat rides along Tam Coc. However, I would recommend at least spending a couple of days here to truly soak it up and, if possible, longer. We stayed for 4 days and, even then, we didn’t feel it was enough. The area is so beautiful that it contains two UNESCO world heritage sites: Trang An Grottoes and Tam Coc. But there are also plenty of smaller sites to explore and it’s easy to get off the beaten path. 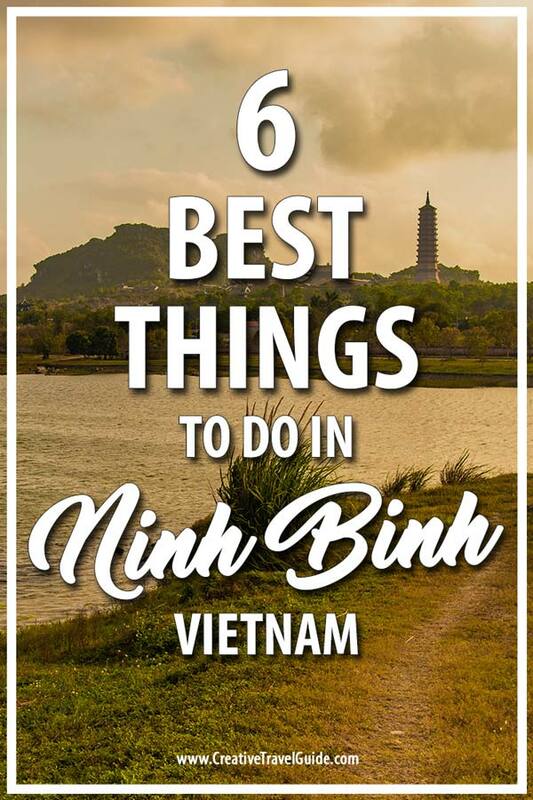 Here are 5 of the best activities that you might want to try when exploring Ninh Binh province, Vietnam. Probably the most popular activity people undertake in Ninh Binh are the boat tours. These typically run a couple of hours and might take you through water caves and onto islands with some gorgeous pagodas. There are three major areas in Ninh Binh province for boat rides. Tam Coc is probably the major one of these. This is famous for the rowers manoeuvring the oars with their feet (apparently good for the back). Tours last 1.5 hours and will take you underneath 3 famous caves. You’ll likely visit pagodas on islands en route. The Trang An boat ride is longer than Tam Coc, totalling 2-hours. Here, you can choose from 3 routes. 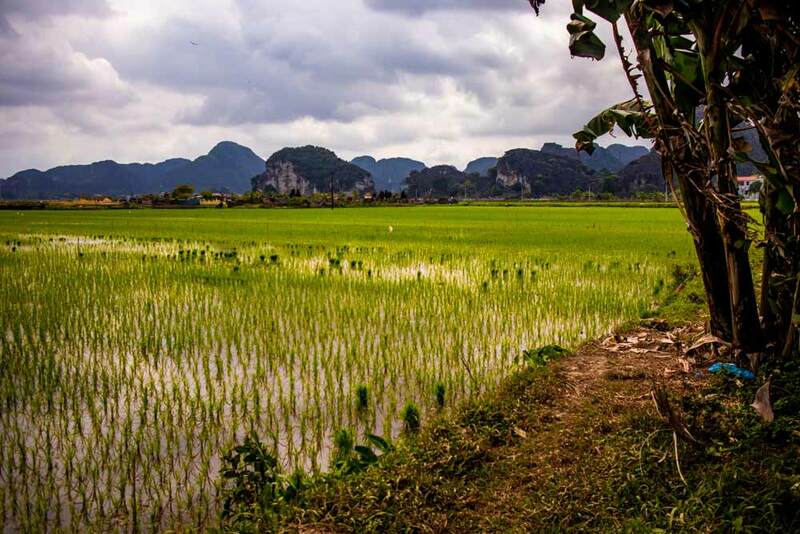 While Tam Coc takes you along the rice paddies, Trang An weaves through the karst landscape with the peaks rising dramatically above you. Choose the right route and you might also find yourself upon Skull Island, one of the filming locations for the recent King Kong film. The plane wreck is still there. Van Long is quieter than the other two boat rides and takes you through a wetland nature reserve. This is great for bird watching and you may see spoonbills and crakes. If you’re lucky, you might also see an endangered (and protected) Delacour Langur monkey here, although these aren’t easy to spot. Also, a quick tip. Be wary about doing any these tours during festival times. We visited during Tet (Lunar New Year) and we ended up queuing 3 hours for Trang An. Take an umbrella for shade as you queue, as well as these queues, are often in direct sun. 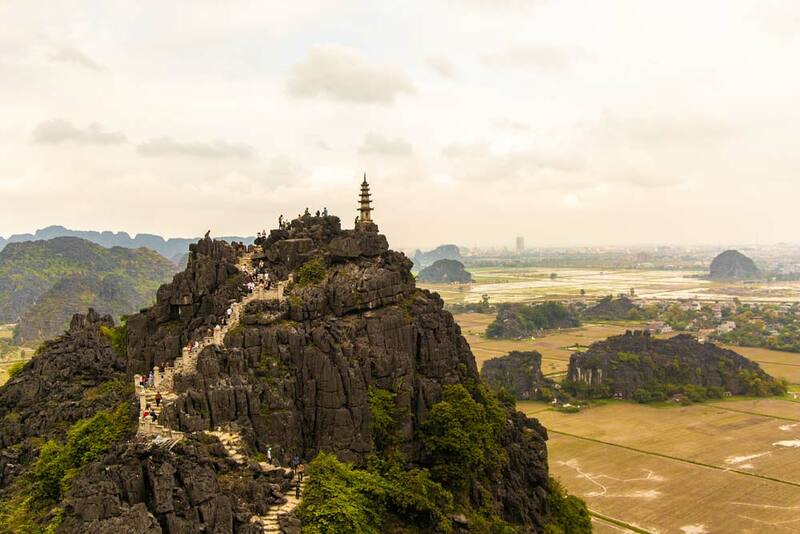 The view you often see on Instagram of Ninh Binh is from Hang Mua viewpoint on top of a limestone peak that looks over Tam Coc and the surrounding rice paddies. Often, in these pictures, you’ll also see the stone wall and perhaps a glimpse of one of the 500 steep steps that lead up here. It’s well worth the climb, for the views at the top are simply stunning. 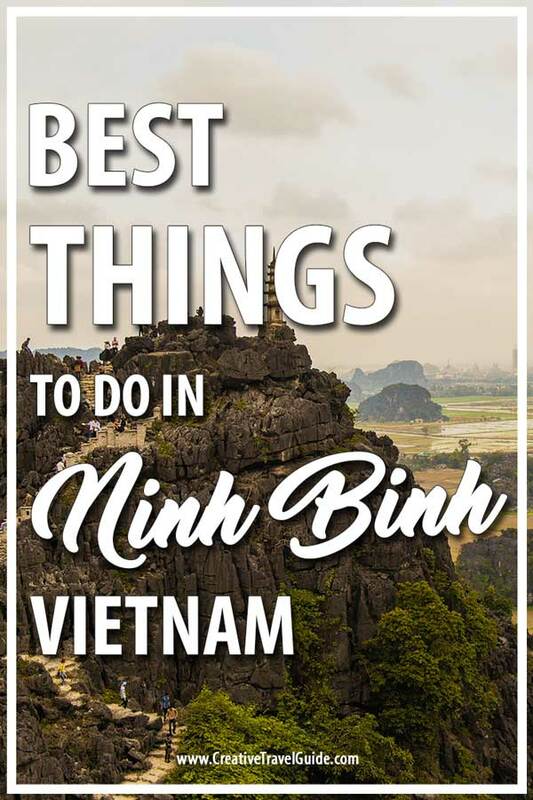 On a clear day, you’ll even be able to see Ninh Binh city in the distance as well as the Tam Coc valley and the layered limestone peaks that fold into each other behind this. Somewhere around step 300, the path upwards forks. Most take the route to the left up to the main pagoda, but there’s another layered pagoda off to the right. If you have the energy, it’s perfectly fine to do both. Like the boat tours, Hang Mua can get pretty busy, especially during festival times. It’s a good idea to arrive earlier, to avoid queues. Unfortunately, however, the place doesn’t open for sunrise. For many Vietnamese Buddhists, Bai Dinh Temple is a pilgrimage site. In fact, this is the largest pagoda complex in Vietnam and (reputedly) in Southeast Asia. It’s situated on a hill which means plenty of steps to climb. It has multiple temples, a corridor of 500 Arhat statues made of local stone, grottoes and caves, a towering pagoda and a 60-ton giant bell. Bai Dinh pagoda looks particularly spectacular when viewed from across the lake to the northeast. The valleys through Ninh Binh’s karst landscape are rather flat, making them great for. There’s plenty of roads here that see little traffic, some of which pass between rice paddies, others which run by streams, rivers or lakes. The road to Bai Dinh pagoda (above) is an especially beautiful place to explore by bike. There’s a lake just north east of the pagoda which takes around an hour to cycle around and offers some stunning views of Bai Dinh pagoda from a distance. Dotted around this lake are several smaller pagodas also well worth visiting and which make great subjects for landscape photography. Hoa Lu may seem a small place, but interestingly it was the original capital of Vietnam, before Emperor Ly Thai To moved it to Hanoi (then Thang Long) in the 11thcentury. The surrounding towering limestone peaks provided natural barriers, and the inhabitants only needed to build walls between them to create an impenetrable enclosure. There’s parking for motorbikes and bicycles inside Hoa Lu, so ignore anyone who wants you to park outside the gate. 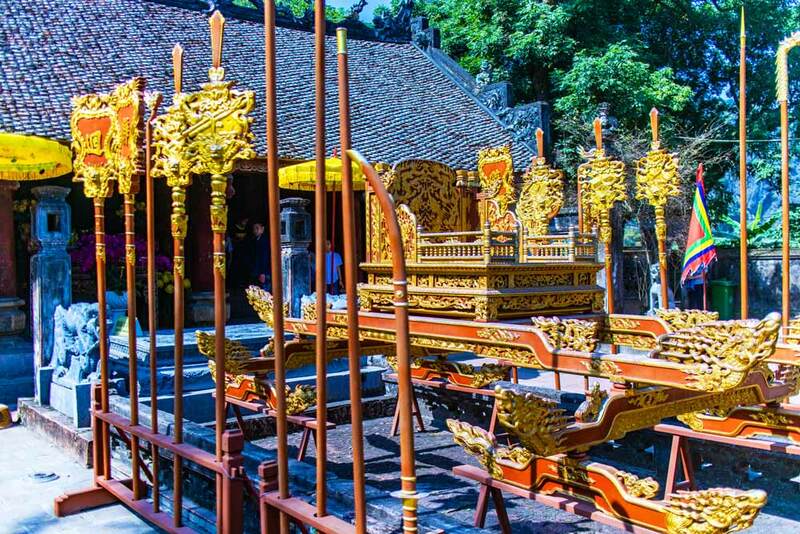 Inside, you’ll find a temple dedicated to Đinh Tiên Hoàng, the first emperor of Vietnam. There’s also another temple dedicated to Đinh Tiên Hoàng’s daughter, Princess Kim, and a beautiful smaller pagoda dedicated to Ly Thai To. Only a small section of the original enclosure’s walls remains, but still Hoa Lu gives you a great insight of the history of the region. You can buy English language books that can provide further insight inside the main temple. 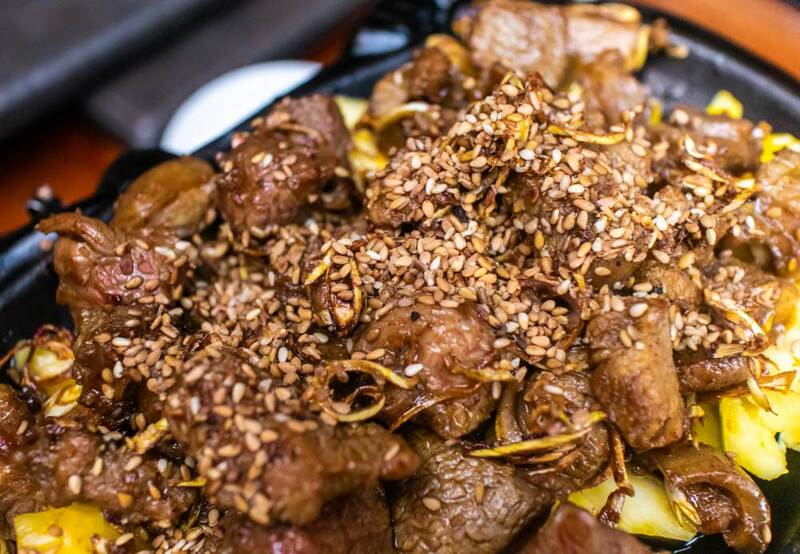 One of the local delicacies of Ninh Binh is goat. Traditionally Ninh Binh locals serve this slightly undercooked, with the skin and meat grilled. 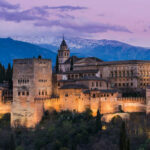 You’ll find this at virtually all of the restaurants at the tourist sites, but you can also find plenty of smaller inexpensive restaurants serving this as you drive or cycle around. The word for goat is dê so look out for that on the signs outside the restaurants. The area around Trang An has a lot of hostels and guest houses, many of which offer rooms in thatched roofed bungalows in idyllic locations. These places tend to have bicycles and motorbikes for hire, and so serve as great bases for exploring Ninh Binh province. If you need to catch an early train out or late train in, you can also choose to stay in Ninh Binh city itself. It’s an industrial city, but there are some pretty areas around the river. Ninh Binh also has a Big C supermarket if you need to get hold of any supplies. 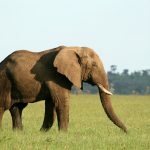 Thank you Chris from Being a Nomad for such a detailed and informative guest post! Where is your favourite place to visit in Vietnam? We will be over there in 3 months, can’t wait!!!! 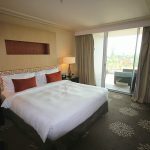 Thanks for the tips on this place in Vietnam.